Cucumber is part of the squash family and is high in folic acid, vitamins A and C and potassium. It is popularly served raw as part of a salad. 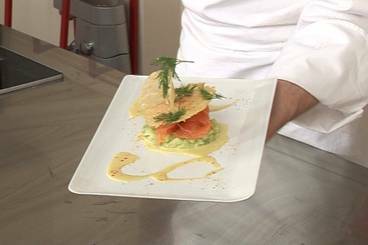 Smoked salmon served on a bed of diced cucumber with horseradish mayonnaise and a crisp parmesan tuile. A cooling accompaniment to a hot curry. Natural yogurt flavoured with mint and cucumber. A delicious fresh salad with a spicy sweet, sour dressing. Literally stuffed cucumber with vegetables and a kimchi-style chili paste. A refreshing summer soup of cucumber, avocado and mint. Served with snipped chives and a swirl of Greek yogurt. Young cucumbers in an aromatic pickle of shallots, black peppercorns and dill.